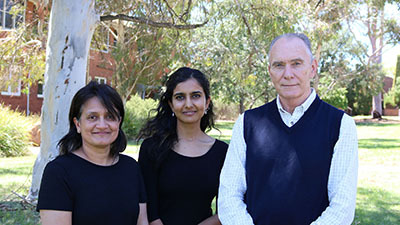 The Graham Centre recently hosted Dr Nivedita Narain from PRADAN, a non-government development organisation in India that works in communities to strengthen the ability of the rural poor to earn a decent living. Dr Narain has worked for many years with Graham Centre member Associate Professor Gavin Ramsay, most recently in agricultural research projects with women’s self-help groups. The projects in the endemically poor East Indian (Chota Nagpur) Plateau (EIP) region involved diverse stakeholders including Australian Centre for International Agricultural Research (ACIAR), scientists from four Australian universities, scientists from two research institutes, development professionals from PRADAN, and women’s self-help groups. The project changed perceptions of women as farmers, saw them become involved in research and created opportunities for social change by empowering these women. Dr Narain explains in the question and answer. What do you think we can take away from how the project in India evolved in terms of how we look at how research is conceived and enacted? The relationship between development and agricultural research is complex. In part the complexity is generated by the various people involved and the contrasting purposes, desires and expectations. Each stakeholder’s experience and interpretation of impacts is also likely to be different. Reflecting back on the ACIAR-supported research projects we have been engaged with, we characterise our research ‘as though people matter’, as development or change-driven research. In contrast, most current approaches tend to be more research-driven, popularly referred to as research and development, agriculture research for development, or AR4D and research in development or RinD. We have learnt that research may seek to drive change, but may not be relevant to farmers, and its diffusion remains a challenge. However if we were to enact research as supportive and facilitative of development and change, where farmers have a voice in shaping it, we may indeed have a more useful model of development-driven research. Such an approach may be operationalised using a framework of inquiring systems (or systems thinking). We are currently working on a paper on this to articulate what was learnt, and how that learning can be applied in other research projects. A second takeaway is that we need to view the research system as a system of inquiry within a development or change system. The key question we faced was, can we expect users or farmers to think and act differently if we are not prepared to do so ourselves? So what did that mean for the research team itself? The stakeholders need to value collaboration, to build relationships, to communicate with respect and openness, to facilitate inclusive learning and to value diverse perspectives. What do you see as the value of international collaboration in research? International collaboration in research has value for all those involved. The more obvious advantage is the sharing of scientific knowledge and experience. In particular, Australian scientists have a lot to contribute to Indian rural and agricultural development. And the investments in agricultural research are important to developing countries. It is also more or less established that collaboration between international scientists and local NGOs can facilitate social impact. seeking out insights from non-conventional and invisible sources of knowledge, particularly (marginal) women and men’s voices. deliberately designing to transcend discipline boundaries from the outset. actively bringing in practitioner experience, insights and knowledge. strategically bridging gaps between institutions (including NGOs) involved with the production of new knowledge and new practices, and articulating the complementary roles of such institutions clearly. What are the key things that you will take away from the short stay in Wagga Wagga? I have had a glimpse of the wonderful work being done at Charles Sturt University, in particular the Graham Centre for Agricultural Innovation and the Functional Grains Centre. The symposium, and the idea of ‘practice change’, is the need of the hour, and I am honoured to have been part of it. I was struck by the quality of the interaction between farmers and researchers/scientists here. I was also inspired by the women in agriculture movement, and the journey of women as they organised to have their voice heard. I have met wonderful scientists and researchers here and look forward to an opportunity to work further together.